Morecambe suffered an opening day defeat to League 2 new boys Grimsby at Blundell Park. The Shrimps suffered the worst possible start when they went a goal down after just six minutes. A ball came into the box from the right and after an attempted clearance was blocked Kayden Jackson was in the right place at the right time to drill the loose ball past Barry Roche. The home side went close to a second goal two minutes later when James Berrett ran on to a neat through ball and saw his chip beat Roche only to be superbly cleared off the line by Aaron McGowan. The home side maintained the early pressure with the busy Jackson curling a shot inches wide of the right-hand post after a superb run to the edge of the Morecambe box. After a sluggish start Morecambe began to find their feet with Kevin Ellison's flick on almost finding Tom Barkhuizen in the box and Jack Dunn's spectacular overhead kick being blocked by Andrew Boyce. The pressure should have paid off on 39 minutes when Barkhuizen was given a free run on goal by a poor backpass but he shot straight at James McKeown. The home side took charge again in the second half and went close on several occasions. Luke Summerfield headed a Ben Davies corner wide and Jackson failed to find Vernon when free in the box. James Berrett sent a superb volley inches over the bar before Davies added a second with a stunning fee kick from 25 yards that flew into the top right hand corner of Roche's goal. The Shrimps hit back and saw Grimsby reduced to 10 men 20 minutes from time when Josh Gowling brought down Kevin Ellison when he was free on goal and was shown a straight red card. 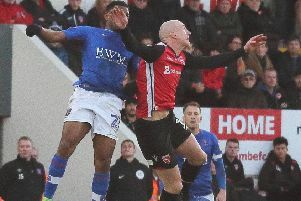 Jim Bentley's side looked to make the advantage count but couldn't find their way through a packed Grimsby defence as the home side celebrated their return to the Football League with three points. Grimsby: McKeown, Davies, Gowling, Boyce, Andrew, Berrett, Summerfield, McAllister, Bolarinwa (rep Pearson 73), Jackson (rep Chambers 86), Vernon (rep Bogle 73). Subs not used: Chambers, Vose, Browne, Jones, Warrington. Morecambe: Roche, Wakefield (rep Molyneux 73), Edwards, Whitmore, McGowan; Fleming, Wildig (rep Stockton 46); Barkhuizen, Rose, Ellison, Dunn (rep Turner 67). Subs not used: Nizic, Kenyon, Mullin, Conlan.